Take the hassle out of the weekly wash with Hoover’s smart range of washing machines. 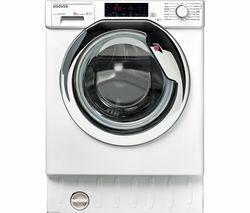 Large, small, energy and water efficient, freestanding or integrated washing machines, with loads of programmes and cycles to choose from, Hoover washing machines make laundry simple. Whatever your household’s needs there’s a Hoover washing machine to match. Capacities range from a slim and compact 6kg to a family-friendly 13kg, so whatever your load size, you’re covered. Smart washing machines allow you to control your wash from your smartphone. 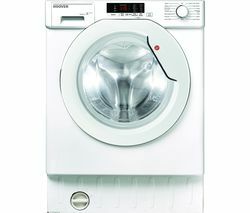 And with energy ratings from A+ to A+++ to choose from you’ll be saving energy and water with every spin. Using an Intelligent Washing System and Kg mode, models like the Hoover DMP413AIW3 automatically weigh your washing, then adjust the water, time and electricity consumption to suit. A range of innovative programmes and wash cycles puts you in control, with Quick Wash getting things done in just 14 minutes, All in One in 59 minutes letting you mix colours without fear of colour runs, Easy Iron taking the hassle out of work shirts, and All Baby 60 helping you wash baby items, fast. For a helping hand with your laundry, Hoover washing machines have thoughtfully designed and energy-saving options that are perfect for every home.